Saying good bye to New Zealand made us feel pretty sad, but with our arrival in Sydney excitement took over. Our car was waiting for us and we couldn’t get to work on it soon enough. Pius, the previous owner of our Troopy, had the car perfectly customized to suit his needs. 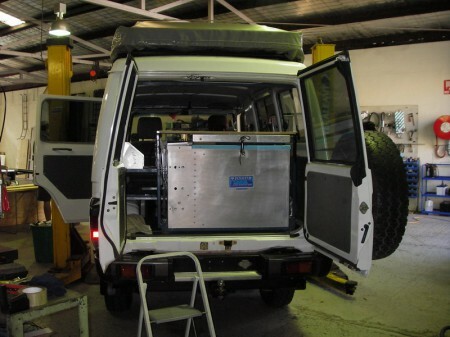 A separate side door, a huge 80ltr slide-out fridge/freezer in the back, a solar panel on the roof rack and a stainless steel water tank being just some of the smart alterations and accessories that make the car quite unique. 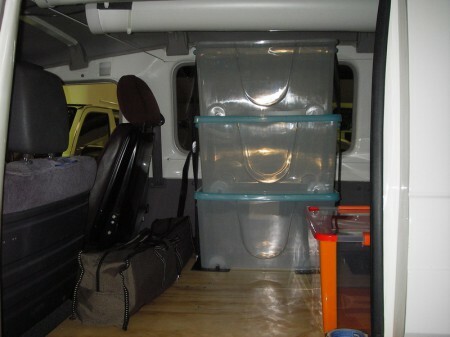 We decided to add a full sized plywood floor, which allows us to store smaller items underneath and sturdy plastic boxes with our gear on top of it, a set up that had worked for us before. Because we will be travelling on unsealed, corrugated roads a lot, everything in the car has to be tied down properly to avoid damage and ear shattering noises. Table, chairs, cooker, gas bottles and our tent, they all have their spot and are secured with straps. Working and organizing things kept us busy and we missed out on most of Sydney’s attractions. 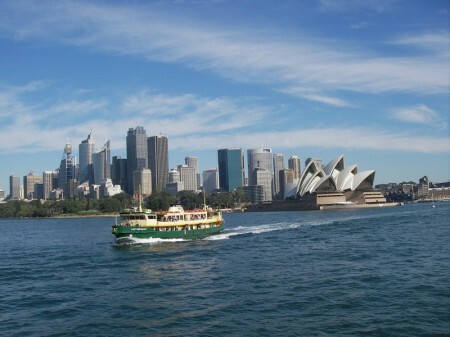 Twice we managed to catch a ferry from Manly to Circular Quay though and enjoyed the ride very much indeed. 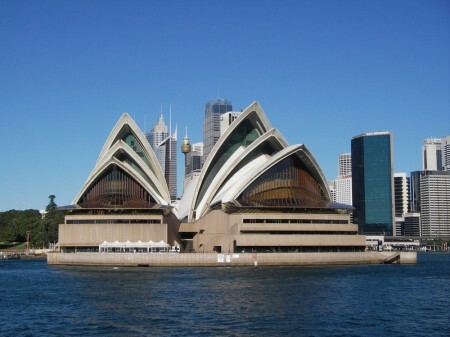 Coming out of one of the many bays and seeing the opera house and the harbor bridge from the water is spectacular every time. 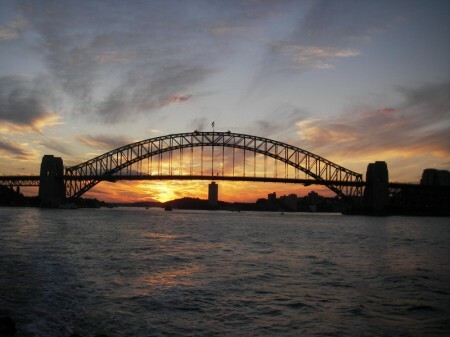 The city with its huge harbor and the northern and southern beaches has heaps to offer, whether you are a surf bum or interested in cultural activities. And then a dream came true. 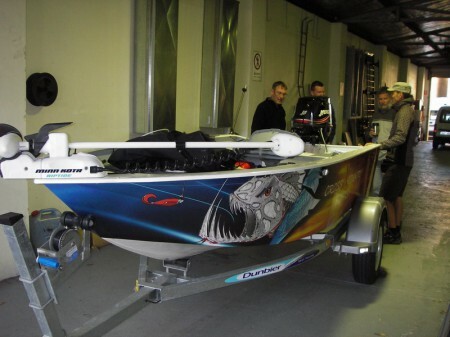 Early one morning, Mike and his dad, having brought the boat down from Brisbane, were waiting for us in front of the workshop; the stunning little rig with the evil minnow vinyl wrap gleaming in the morning sun. Seeing our boat for the first time was awesome and a little bit like having Christmas and one’s birthday at the same time. Getting it all done took us almost four weeks, but eventually, all the pieces fell into place. Plumber pipes – they make perfect rod tubes – take care of our rods in the car and rod holders in the rod locker in the boat will accommodate them when on the water. We got anchors, chains, ropes, fire extinguisher and a spare fuel tank for the boat, designed a lure retriever out of a telescopic pole and a piece of stainless steel rod (thanks for your help, Robert), bought tools, pots and cutlery and had the boat, trailer and car registered and insured. 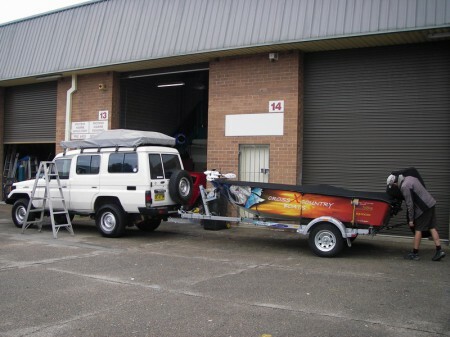 And finally the great, friendly guys from Protrim in Dee Why fitted a stone guard to the trailer to prevent the boat from getting damaged and made an additional cover for the electric motor in the bow. Boat and outboard came with a very stylish, perfectly tailored black canvas cover already. A clear plastic window, added to the roof rack cover and made by Protrim as well, enables the solar panel to charge the battery all day long. What a great feeling to be on the road for the first time! Four weeks after arriving in Australia we are on our way up to the Blue Mountains. Our search for accommodation – staying in the tent by night temperatures around 0°C and below not looking that inviting – led us to Dallas’ Megalong Valley cabins. The towering cliffs of the mountains in sight, the cabins make a great holiday getaway.